‘Social media influencer’ has become a form of celebrity in its own right, with people amassing hundreds of thousands of followers by showcasing their daily lives, purchases and holidays. Between a fifth and a quarter of social media users follow one of these celebrities, vloggers or social media influencers. Not only do we follow them, but some of us are led by them in our purchasing habits: a quarter (27%) have bought a product recommended by a celebrity, vlogger or influencer. And although regulation already exists which dictates that social media users must make clear that a post is sponsored, nine in ten Brits (90%) think they should do more to be transparent. 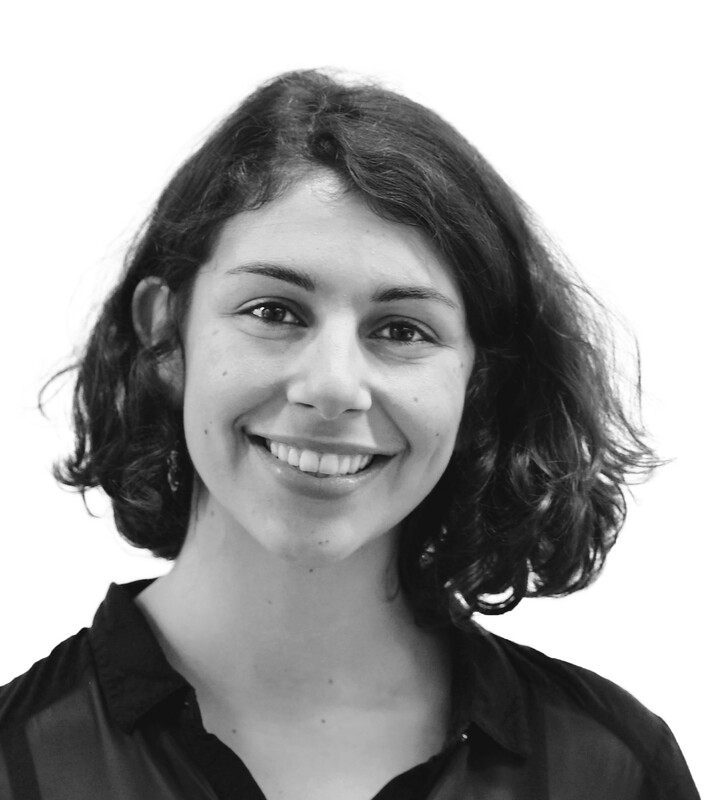 While recommendations clearly work, there’s evidence that people want to know the motivation of the endorser: is it simply helpful advice, or were they paid to say it? 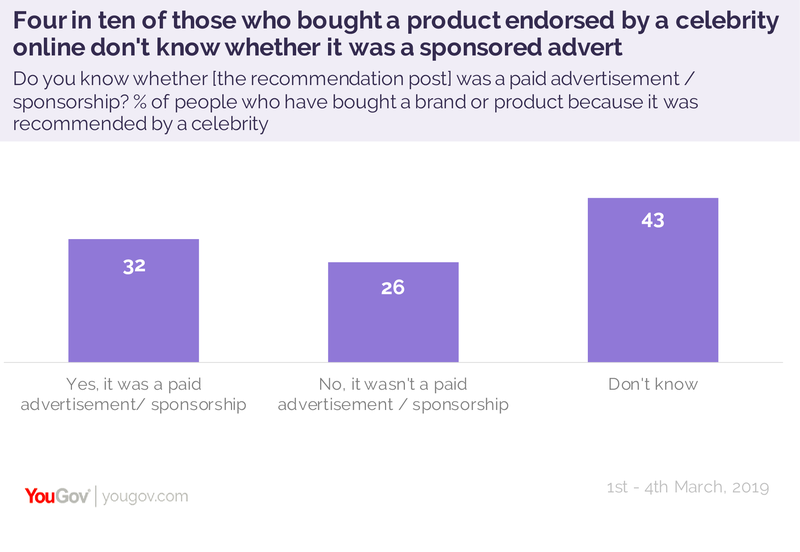 Four in ten (43%) of those who purchased a product following an endorsement weren’t sure whether the recommender had been paid. 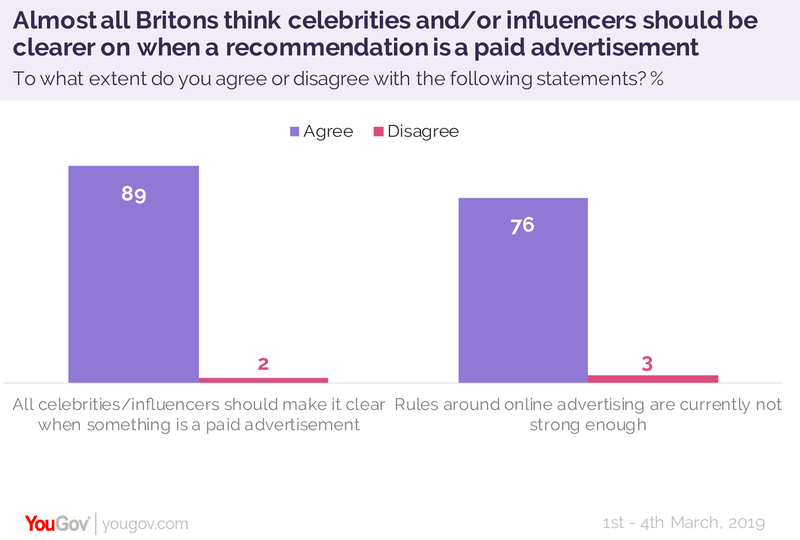 This confusion could be problematic, as nine out of ten (90%) want all celebrities and social media influencers to make it clear when a product recommendation is sponsored. However, YouGov’s research indicates it is in the best interest of brands to hide this information as much as possible - four in ten (44%) say they wouldn’t watch or read a post at all if they saw it was sponsored, and seven in ten (71%) say they find a sponsored endorsement harder to believe. Who is most led by social media influencers? According to the research, Instagram is the most powerful social media network for influencing purchases – 6 out of 10 users have bought a product as a result of a recommendation. Our data also reveals that social media recommendations have driven a third of women (35%) to purchased a product, compared to just one in five men (18%).